View Zion Park Campgrounds in a larger map Whether it's a pop-up, cabover, camper van, forty foot RV or four-pole boy scout tent, there is a place in or around the park to enjoy the sounds of Zion at night. 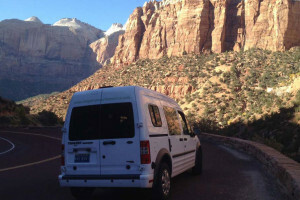 Camping is a popular option for Zion visitors, often filling up during the summer, as well as during weekends in spring and fall. There are no showers or full-hookup campsites, but the location couldn't be better. The Zion campgrounds by the South Entrance are located in desert terrain, so expect to be in the sun for at least part of the day, even on a river site. There are few trees and little other shade, so plan accordingly when finalizing the trip. Because only there is only one Zion National Park campground that accepts reservations, take a look at some of the private campgrounds located just outside the park to the south or east. There is a wide variety of options, including choices for both more or less amenities than the park campgrounds offer.